Joyce Adewumi is an accomplished singer, choreographer and educator based in Harlem New York. 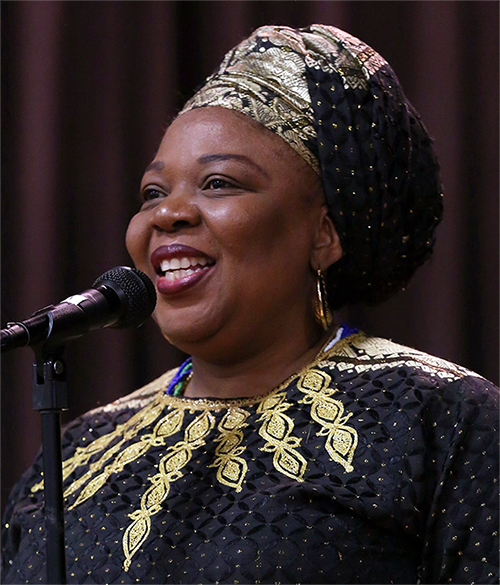 She is Founder and President of the New York African Chorus Ensemble and various community partnerships around the city. As a thought leader in the field of humanities she continues to groom the youth. In this interview we learn from an Osun priestess and proud practitioner of Yoruba philosophy. As a strong proponent of Yoruba culture and a long time resident of Harlem. Do you connect with the Afro-Latino community where there are many practitioners? (Joyce) As a fully initiated Osun Priestess and an Iyanifa, I organize lectures on African spirituality that are attended by the African American, African, and the Latinx communities. These lectures are given either by my godfather or me. Both the initiated and non-initiates attend these workshops which aim to help individuals understand better the differences between God’s laws and man-made laws. So many people are practicing man-made laws and they often find it difficult to break away because this is what they have inherited, and they don’t know anything else. For example, God intended for us all to know who our Guardian Spirit or Orisa is so that we may better understand our dos and don’ts. I am talking about a practice parents used in the olden days in Africa to access the “Blue Print” of their children’s lives so that they fulfill their potentials, achieve success in life and not experience premature deaths. This is not magic. It is just connecting with the esoteric celestial realm (mind of God) and downloading the necessary information that parents need to do their job of raising their children. It is the elder who will remind the young person to work hard not for the purpose of just amassing wealth, but so that he would be useful to his community. 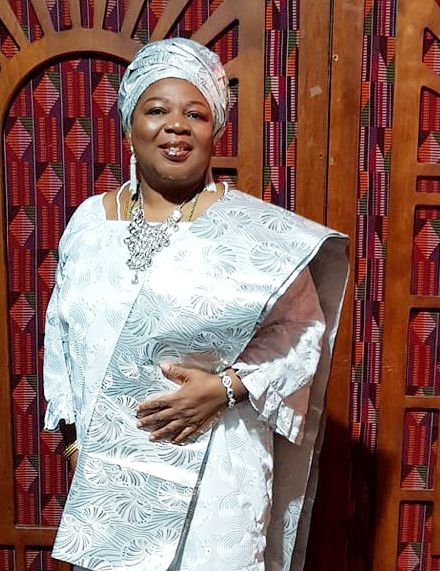 You are the founder and executive director of the New York African Chorus Ensemble which has held its Annual NYC Multicultural Festival, successfully drawing support from many cultures in New York City. It seems however that there are no visible partnerships with out-of-state organizations who could benefit and scale the size of your festival. Is this by design? (Joyce) The NYC Multicultural Festival is a program of my organization, the New York African Chorus Ensemble, where I serve as the President and Founder. The festival was founded in partnership with the New York Police Department when Chief Philip Banks III rtd., was seeking community leaders who were willing to partner with the NYPD in creating programs that would help to reduce hate crimes and foster a better relationship between the NYPD and civilians. My proposal was a festival that brought together all New Yorkers in celebration of our diverse cultures. while allowing the NYPD, from the Commissioner to the lowest ranking police officer, the opportunity to engage with the community in a peaceful environment. My premise was that if we all could meet on a neutral and peaceful ground then we can begin to dialogue, put aside our differences and heal. The Festival was a huge success, we received invitations to organize it at various venues. One thing that we soon learned was that our constant change of venue retarded the growth of the festival. After its 6th year and while I was serving as the chair of the Manhattan Community Board 9 Arts and Culture Committee, I was asked by the then chair of the Community Board, Rev. Morgan-Thomas to bring the festival in my district and that is where we have been since then. The NYC Multicultural Festival has now grown into a two-weekend affair and we are looking forward to making it a weeklong series of events. Sponsors and exhibitors are welcome to promote their brand at the festival. I have received many invitations to bring the festival to other boroughs and states, but these invitations have not yet been backed up with financial assistance. It takes a great deal of money to put large festivals together. Many younger successful creative professionals and artists based in American of other cultures who are doing great work believe in “Self-Initiation”. Similar to democratizing the practice of West African belief systems. The reason being because of the human ego and rise of charlatans and culture vultures. Are you opposed to the self-initiation path given the practices you have been exposed to? (Joyce) There is a Yoruba adage which loosely translated says, “a child that has an elder to lean on cannot fail.” Fail in what? you may ask. Failure comes in many forms. Aside from one’s professional work, an individual may fail when it comes to his relationship with his parents, siblings, lover , spouse, co-workers, community, etc. Failure in one or more of these areas may result in unhappiness, depression, etc. It is a European concept to work alone without guidance from adults. We have many examples of what happens when a young person grows up without proper guidance and/or mentors. It is the elder who will remind the young person to work hard not for the purpose of just amassing wealth, but so that he would be useful to his community. It is the elder who will teach the young ones the importance of leaving a place better than they found it or making the people they meet happier than they were before he met them. How many young people understand that helping others is the key to unlocking their own blessings? It is an elder who will help the young ones understand that charlatans and culture vultures get their punishment on this earth. Voza rivers and the Harlem Arts Alliance worked with you an numerous occasions, how did that come about and will we see future collaborations with your organizations? (Joyce) Mr. Voza Rivers has been like an angel to me. He gave me the opportunity to serve as the African Correspondent for Harlem Arts Alliance from 2007 to 2014. When I was appointed to serve on the community board, I could no longer serve HAA because our meetings were on the same day and my workload had increased. Things are a bit better now. I can definitely confirm that there will be future collaborations between our organizations. In your quiet or noisy moments how do you get inspired to inspire others. What ultimately motivates you to do the work you do? New York City, though changing, is not the most calm of places. (Joyce) Because I am around people of all ages all day long, I am almost consumed by the realization that we have to hand over the baton to the young people before we get too old. In addition, we have to give young people a strong moral and spiritual foundation so that our future can be just as good as our present. I am inspired by my father’s advice, “wherever you go, make it better than you found it. The people you meet, make then happier than they were before you met them”. All the interns in my organization have been promised a permanent job in New York African Chorus Ensemble. They know that they will take over the organization when I am too tired or preoccupied with building my next legacy project. To prepare them to take the baton from me, I help them in knowing who they are. “Man know thyself” is a powerful statement. Knowing who their guiding spirit is, is the first process in unlocking their potentials. I cannot begin to explain how the individual blossoms and is gradually transformed when this information is known. Every day, is a class for my “Future Leaders”. As they learn various aspects of the organization, I explain to them the spiritual principles behind the practice. They know that I am speaking the truth because I deal with them on the level of the Soul. You can’t lie to the Soul. Gradually, the lust for money is replaced by the importance of serving the community; deception gives way to commitment; failures are replaced by successes; feelings of inadequacy are replaced by greater self-esteem; pent up emotions are released along with the verbalization of the solutions to the root cause. I have taken one of my interns to Nigeria. I hope to take all of them to Nigeria when we have sufficient funds. I want them to know that the world is their canvass and they can achieve whatever they set their mind on. They just have to work hard and help the people they meet along the way. My interns inspire me. I love them and I am proud of the work they have put in to heal and transform themselves. They are becoming Future Leaders who will make positive contributions not only to the organization, but more importantly, this world. With the kind of access you have to the kings and royalty in Yoruba land, added to your business acumen, what are your future predictions on the state of the Americas as well as Nigeria your home country? (Joyce) I am deeply grateful and humbled by my association with the Ooni of Ife, the Emir of Argungu and the Onikun of Ikun. I believe that in the near future, Nigeria will achieve the level of trust, professionalism and safety that would make doing business in Nigeria more attractive to foreign investors. I am an optimist! There are several projects that we have on the burner, but I am not at liberty to discuss them at this moment. What can the New York community expect for Ms Adewumi over the next 5 years? (Joyce) Within the next 5 years, the NYC Multicultural Festival will become a household name and it will be known as the definitive festival that showcases NYC as the cultural capital of the world. The NYC Multicultural Festival will become a destination for local and foreign tourists. With the support of the Elected Officials and private partners, I will also improve upon and create new programs that will bring attention to the plight of artists in this city. Artists have been given a bad deal despite all the beauty and healing we bring into the world. You should also watch out for my Interns, they will be creating new programs that will service the community. Thank you for this opportunity to speak to you about my work in this great city that I love and which has been good to me.